It was in Susan Wójcicki’s garage where Google had its first headquarter. Since then Wójcicki is one of top Google executives – now as YouTube’s CEO. Her sister, Ann Wójcicki was married to half of Google’s duo (Sergey Brin) and is the mother of their two children (although they divorced this year; Ann is CEO of 23andme, backed by Google). Both are daughters of Professor Stanley (Stanisław) Wójcicki, born in Warsaw, Poland on March 30th, 1937. How the Wójcickis came from Warsaw to Silicon Valley? It was all due to their grandma, Janina, who died two years before Larry and Sergey moved to her granddaughter’s garage. Grandma Janina was an art historian. She defended her doctoral dissertation Life in the Court of Casimir the Great in 1947 at Jagiellonian University, Cracow. Soon after, in 1949 she moved with two sons to the US, but… no. I will start from the beginning. Her history is so entangled we will both lose the thread otherwise – both you and me, my dear reader. I was born on February 19th, 1912 [in other documents there is annotation: „in old style”, therefore it was March 3rd in our calendar] in Kuprowo near Dyneburg [now Kuprava near Daugavpils in Latvia], where my parents Michał [his surname does not appear in the CV!] and Jadwiga née Bielska where seconded from Vilna [now Vilnius in Lithuania]. The early childhood (since the second month of my life) I spent in Nowa Wilejka [now Naujoji Vilnia] near Vilna. There I graduated three classes of my secondary school (old-styled „gymnasium”). The next three classes I graduated in Wołkowysk [now Vawkavysk, Belarus]. Due to severe and prolonged illnes in 1929 [she was 17 then] I paused learning. I finished my secondary school only in November 18th, 1933 as extern, in Brześć nad Bugiem [now Brest, Belarus]. 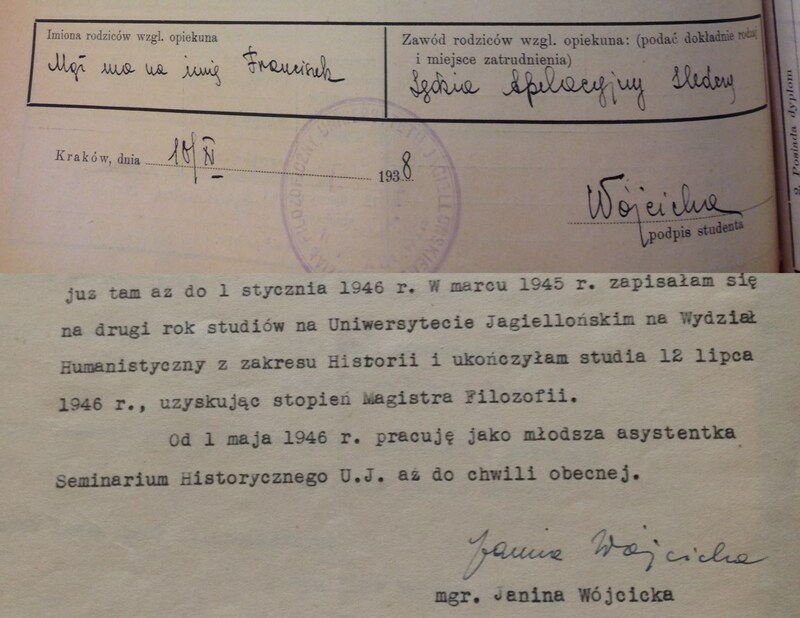 I enrolled in Jagiellonian University, Humanities Department in October, 1938. Let us stop there and note the details omitted in Wójcicka’s CV. Actually, the five years omitted here are (October 1933 to October 1938) are not just details – they are crucial. When in October 1938, then 26 year old Nina-Janina Wójcicka (this is how she was called in the documents) enrolled as a freshman, she did not disclose her parents’ names (unlike in the post-war documents). Instead, in the entry called „Parents or guardian name(s)” she just wrote „My husband’s first name is Franciszek”. And in the entry called „The parents/guardian job (give exact kind and place of work)” she entered „Investigating judge in the Court of Appeal”. We can also learn from it that earlier, in 1934 she was enrolled in the Department of Humanities, Józef Piłsudski University in Warsaw. The only Janina born 1912 who enrolled in the Warsaw University (it changed its name after Piłsudski’s death in 1935) is „Janina Kozioł” (according to the inventory accessible in the Jagiellonian University Archive). I am certain that it was „Janina z domu Kozłow” (Janina née Kozłow) misread as „Janina z Kozłów” (Janina née Kozioł). The form of her maiden name („Kozłow”) is known from her American period, but I didn’t manage to prove it so far. A contrario, I found another child of Michał and Jadwiga née Bielska (exactly the same as Janina), born in 1906 in Dyneburg (almost the same as Janina): Teodor KozłowSKI. I know that „he studied law in the Stefan Batory University in Vilna and 5th Infantry Officer School in Cracow. Leutenant (podporucznik) since January 1st, 1933, served in 10th Składnica Materiałów Intendentury in Przemyśl. Subsequently he worked in County Office in Bielsk Podlaski. He was a bachelor”. I know it from the Katyń Cemetery Book. Because this Teodor Kozłowski, held as prisoner-of-war by Soviet Army in 1939 was detained in Kozielsk and in early 1940 murdered in Katyń. THE KATYŃ. Nina-Janina Kozłow must have married Franciszek Wójcicki soon after – in 1934 she is enrolled as „Kozłow” and on May 5th, 1935 in Warsaw she bore her first son, Professor Andrzej (Andrew) Wójcicki. This is probably why she stopped studying. Soon after, on March 27th, 1937, also in Warsaw, another son was born – Professor Stanisław (Stanley) Wójcicki. It was only when Stanisław was year and a half old and family moved to Cracow (because her husband received a new job) Janina started studying again, this time in Jagiellonian University. In September 1939 I submitted myself to work in the Charity Section giving help to refugees and displaced persons in Cracow. I worked there until September 15th, 1941, and subsequently (having completed accountancy lessons) I started working in the Cracow Bank of Issue. It was until January 1st, 1946. In March 1945 I enrolled in the second year of history studies in the Humanities Department of Jagiellonian University. I completed the studies on July 12th, 1946 being awarded M.A. in Philosophy. Since May 1st, 1946, I work as junior assistant professor in the Seminary of History, Jagiellonian University. We should remember that in 1938 the whole family (with two infants) depended on the Judge Franciszek Wójcicki salary. When he emigrated, It must have been a very hard time for Janina. Franciszek was pursuing his career instead: he arrived to London and took the job of the head of office in Polish Parliament in exile (Rada Narodowa RP). He worked closely with Polish Prime Minister, Stanisław Mikołajczyk and like him he returned to Poland after the war. Franciszek was elected Member of Parliament during the 19th January, 1947 election. I don’t know why in the CV quoted above (written in 1947) Janina Wójcicka didn’t mention her marriage at all. She even didn’t give a hint that she was married. She was defending her dissertation soon after Mikołajczyk (then Deputy Prime Minister) fled from Poland. It is quite likely that being a wife of anti-communist politician in communist-ruled Poland was not something to boast about. It is also quite likely also that the long-term separation strained their family ties. What I know is that in 1949 Janina took her sons and moved to the US. Franciszek also tried but he was arrested instead. Janina W. Hoskins, retired area specialist for Poland and Eastem Europę for the Library of Congress, died on October 19 in Menlo Park, CA. Dr. Hoskins was bom in Kuprovo, currently in Latvia, and received masters and doctoral degrees from the Jagiellonian University in Kraków, Poland, where she taught history. During World War II, Dr. Hoskins was a member of a charity committee in Kraków that assisted refugees who had been expelled by the Nazis from their homes in Poland’s western and northem territories. In 1949 Dr. Hoskins came to the United States. She worked in a congressional office before joining the Staff of the SIavic Division of the Library of Congress in 1952. Her contributions to the Library were many. She helped negotiate the Public Law 480 program with the Polish govemment which permitted the repayment of post-World War II U.S. aid through donations of Polish publications to U.S. libraries. On behalf of the Library of Congress, Dr. Hoskins traveled to Poland on numerous occasions to discuss acąuisitions and to lecture on the Library’s work in Slavic studies. She also participated in Voice of America radio programs. Dr. Hoskins prepared many exhibits and displays on Poland at the Library of Congress. These included “The Millennium of the Baptism of Poland in 966,” “Nicolaus Copernicus 1473-1973,” and displays on the contributions of Kościuszko and Pułaski during the American Revolution. Her numerous publications for the Library were concemed with various aspects of Polish book publishing and literaturę, Polish genealogy and heraldry, and Thomas Jefferson’s views on Poland. She also contributed many articles to books and Professional joumals and wrote book review’s for scholarly journals. Dr. Hoskins was recognized with a Meritorious Service Award by the Library of Congress in 1963. A member of the American Historical Association, the American Association for the Advancement of Slavic Studies and the Polish Institute of Arts and Sciences, Dr.Hoskins retired from her position with the European Division of the Library of Congress in 1989. She moved to Califomia in 1995. Why am I investigating the family of Janina Wójcicka? There are two causes – first, I am involved in reconstruction of the social network of Polish historical elites (professors, members of parliament etc.). I am gathering it and publishing it in my sites Wielcy.pl and Sejm-Wielki.pl. But there is another cause: like Dr Janina Wójcicka, I also received M.A. in philosophy in the same Jagiellonian University (48 years after her) and PhD in the same department (51 years after her). I would like to express my thanks to Professor Andrew Wójcicki, son of Janina and uncle of Susan and Anne Wójcicki. Having emigrated 66 years ago, he still writes Polish. We exchanged several emails about their family history. Special thanks to Tomasz Gruszkowski who stimulated me to finish the job and to Google’s Iwona Piwek who urged me to translate it to English (however all errors are my own fault).